A few weeks ago we looked at which teams derived the most benefit from playing at home. This post involves much less analysis and is more of a data dump or description. Enjoy. So we know which teams have been ‘relatively’ stronger at home when compared to their road performance. Now we want to know which teams have been better at home with no adjustments. These ten teams have posted the best home conference records since 2005. No shocker here. The infamous Smurf Turf and the Norman plains have proven a tough test for WAC, Mountain West, and Big 12 opponents over the past decade. Only four teams, TCU – more on them later, San Diego State, Texas Tech, and Kansas State have won conference games at Boise State or Oklahoma since 2005. The only real minor surprises on this list are probably Houston, East Carolina, and Northern Illinois. Seven teams on this list have played in BCS bowls and Houston nearly earned a BCS bowl invite until, ironically, they lost at home to Southern Miss in the Conference USA Championship Game in 2011. Now which teams have the worst home marks since 2005? Only three teams, Duke, New Mexico State, and Washington State have won less than one fifth of their conference home games the past nine seasons. The Blue Devils and Cougars appear to be somewhat on the upswing, with both having participated in bowl games last season. Meanwhile, the Aggies from New Mexico State are still looking for their first bowl appearance since 1960, but at least they have a conference now. Other interesting tidbits: Two dome teams (Syracuse and Idaho) appear on this list. What does that imply? 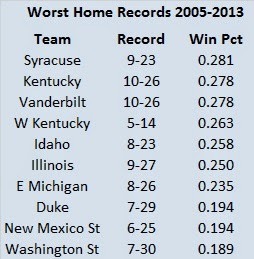 Mainly that Syracuse and Idaho have tended to be pretty bad since 2005, with a few minor exceptions. Eastern Michigan has averaged just 3678 in per game attendance the past three seasons. Fans of the Eagles are not missing much. Which teams have been road warriors? 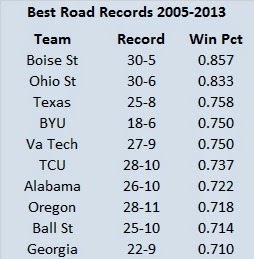 Boise State not only has the best home record over this span, but they have also been nearly as untouchable on the road. Four of the teams with the best road conference records have either played for or won a national title (Alabama, Ohio State, Oregon, and Texas). In addition to those four, Boise State, Georgia, TCU, and Virginia Tech have played in multiple BCS bowl games. 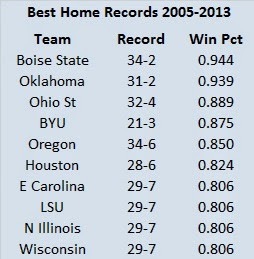 TCU also owns the distinction of having won at both Boise State (2011) and Oklahoma (2005), the two best home teams. However, their win over Oklahoma came when the Sooners and Horned Frogs were not conference opponents. The real surprise on this list is probably Ball State. The Cardinals have been sporadic bowl participants, first under Brady Hoke (2007 and 2008) and currently under Pete limbo (2012 and 2013), but their dominating road performance was certainly unexpected. And finally, I present the worst road teams. 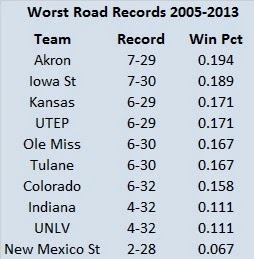 New Mexico State nearly took the mantle of being the worst home and road team since 2005. The Aggies road winning percentage is just more than half that of Indiana and UNLV, the silver medalists in road ineptitude. To me, the most interesting fact about any team on this list is Kansas. The Jayhawks have been absurdly bad over the past five seasons, winning just three Big 12 games in that span. However, you may remember that in 2007, they enjoyed a season for the ages, rising to number two in the polls and winning the Orange Bowl. In 2007, the Jayhawks won all four of their Big 12 road games, but in the other eight seasons, have won just a pair. 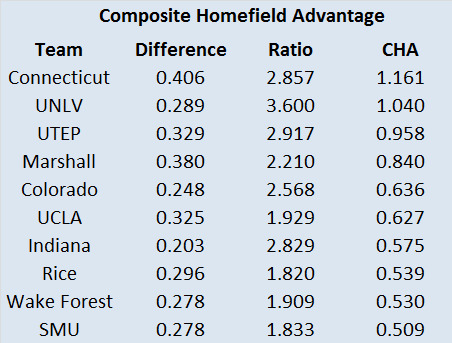 Last week, I examined homefield advantage and tried to determine which teams benefited the most from playing at home versus playing on the road. This week, I want to explore another aspect of homefield advantage. According to a study, located here, homefield advantage dissipates over time. No, this doesn’t mean that the Boston Red Sox and Chicago Cubs should move out of their 100 year old stadiums if they want to win more home games. It means that homefield advantage is strongest earlier in games. In other words, the home team benefits the most from homefield advantage (increased adrenaline, benefit of calls, increased nervousness for their opponent, disruptive crowd noise, and a host of other dynamics that may or may not be contributing factors) early in games and as time elapses, the homefield advantage lessens. To test if this phenomenon is true, I looked at every overtime game in IA (or FBS) college football since 2005 that was a non-neutral site affair (i.e. one team was playing at home). I then simply looked to see if the home team won or lost the overtime game. In 287 overtime games, the home team won just 142. Their overall record was 142-145. For the non-statistically inclined, that means home teams won just over 49% of the time (.4948 win percentage), which is of course, less than half. So there seems to be a great deal of merit to the idea that home field advantage dissipates over the course of a game. Before we leave this issue, I want to delve a little further and look at the betting favorite in the overtime game. Thanks to the great Phil Steele and his college football annual, I have historic point spread data and can determine which team was favored by the Vegas oddsmakers to win each game before it started. My friends, this is where things start to get interesting. The home team was favored in 194 of the overtime games. They won 106 of them (I did not check to see if they covered the point spread as this was not the intent of the study). The 106-88 record works out to a winning percentage of .5464 meaning if the home team was favored, they won in overtime nearly 55% of the time. Now, what about the other side of the coin? If the home team was an underdog, as they were in 91 instances, they won only 36 times. The 36-55 record works out to a winning percentage of .3956, meaning home underdogs won overtime games under 40% of the time. Astute observers will note that 194 and 91 do not add up to the 287 observations mentioned in the previous paragraph. That is because on two occasions, the home team was even money to win against the team they were hosting. The home team lost both of those, but we can’t draw a great deal of conclusions from a sample size of two. The biggest takeaway from this study is that the point spread does a bettor (pun alert) job of picking the winner of overtime games than the venue. Head coaches might do well to keep this bit of information in mind when deciding whether to play for overtime or attempt to win in regulation. The notion of playing for overtime at home should be weighed against the quality of the opponent (as indicated in the point spread of the game) in determining the correct course of action. A prime example of a head coaches’ understanding of this notion comes from Brady Hoke’s decision to go for two against Ohio State after a late score in last year’s game. The Buckeyes came in as a 16-point favorite over Hoke’s Wolverines, so even though the game was in Ann Arbor, the two point call was a smart play. Who Derives the Most Benefit from Playing at Home? Homefield advantage exists. This much we know. What we don’t know is what exactly is homefield advantage and how can we quantify it? Determining what homefield advantage is and the voluminous variables that go into it would require a great undertaking. Unfortunately, I am lazy and impatient, so I will only make an attempt to quantify it, at least to a small degree. In order to quantify homefield advantage (at least as it exists in college football), I looked at every college football conference game since 2005 (nine seasons) that was played at a non-neutral site and compiled each school’s record in both home and away conference games. Neutral site games, such as the annual Florida/Georgia showdown in Jacksonville were not included. I made judgment calls about a few teams, primarily Arkansas but some other teams as well, and considered their games in Little Rock to be home games. I then looked at the difference between each teams’ winning percentage at home versus their winning percentage on the road. But what is the best way to examine the ‘difference’ in winning percentage? The simplest way would be to subtract the road winning percentage from the home winning percentage. But is this the best way? Consider this thought experiment (I will use a sample size of ten so the percentages are easy to calculate): Suppose Team A is a juggernaut in their conference and wins nine of their ten home games in our sample. On the road, though they do suffer an occasional defeat, they are still a force to be reckoned with, winning six of their ten contests. In the same conference, Team B is a perennial loser. However, they are reasonably tough at home, winning four of their ten games. On the road, they merely serve as punching bags or cannon fodder, winning just once in ten games. If we use the difference in their home and road winning percentage, both teams come out with a difference of .300. That would be .900 minus .600 for Team A and .400 minus .100 for Team B. However, I would make the argument that in fact, Team B has the greater homefield advantage (receives the greatest boost from playing at home). If we use the ratio of the winning percentages (home win percentage divided by road winning percentage), we obtain a much different result. Team A has a ratio of 1.5 (.900 divided by .600), while Team B was a ratio of 4 (.400 divided by .100). While Team A is nearly unbeatable at home, they are also solid on the road. Team B on the other hand, is a lost cause on the road, but when they play in the friendly confines, they are almost average. Finally, in an attempt to get the best of both worlds, let’s multiply the difference by the ratio to get our final rating. Let’s call this rating the Composite Homefield Advantage, or CHA for short. For Team A, their CHA would be .450 (.300 multiplied by 1.5). For Team B, their CHA would be 1.2 (.300 multiplied by 4). Alright, let’s stop dealing in theoretical though experiments like an 18th century philosopher and look at some real data. Which teams have the largest difference between their home winning percentage and road winning percentage? The results will probably be a little shocking. Neophytes Georgia State, South Alabama, Texas-San Antonio, and Texas State were not included in this table (if they qualified) because they have been playing conference games for at most two seasons. Apparently homefield advantage is quite pronounced in locales such as Storrs, Huntington, El Paso, Los Angeles, Jonesboro, Winston-Salem, Las Vegas, Dallas, Houston, and Madison. If you asked a casual observer, they would probably only list Wisconsin out of these ten as a team that enjoyed a significant boost from playing at home. What’s interesting about this list is that while most of these teams are not national powers, five have won their conference at least once since 2005 (Arkansas State, Connecticut, Rice, Wake Forest, and Wisconsin), with a sixth and seventh (Marshall and SMU) having played in their league title game. Another interesting detail is that only four teams (Connecticut, UCLA, Wake Forest, and Wisconsin) played in BCS conferences, while four of the ten teams (Marshall, Rice, SMU, and UTEP) played in Conference USA at some point SMU joined the American prior to the 2013 season). Now let’s take a look at which teams had the largest ratios when dividing their home winning percentage by their road winning percentage. Neophytes not included. There is a little overlap, with Connecticut, Marshall, UNLV, and UTEP appearing on both lists. The least surprising team on this list is probably Colorado. The Buffalos have a reputation for being much stronger at home in the thin air of Boulder and this manifests itself in the data. In fact, before their move to the Pac-12, their Big 12 numbers were even more pronounced (13-11 at home versus just 4-20 on the road). Using the ratio method delivers a few more BCS conference teams (Colorado, Indiana, Kansas, and Ole Miss) added to Connecticut for a total of five. It also produces our first dome team, and yet another (former) member of Conference USA, Tulane. So add Las Cruces, Bloomington, Boulder, New Orleans, Lawrence, and Oxford to the milieus that produce a large homefield advantage. Now if we use the CHA method mentioned above, these are the top homefield advantage teams. Once again, neophytes not included. There are no new entries from the previous two lists, but a quartet (or even a pair) of teams stand tall using CHA. 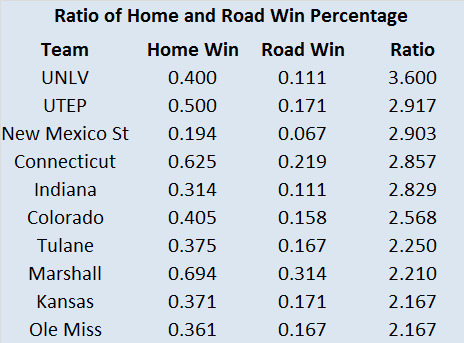 Connecticut, UNLV, UTEP, and Marshall have all enjoyed a significant disparity in success at home versus on the road. What do all four of these teams have in common? For starters, they are all non-traditional powers. No member of the quartet has enjoyed great success at the national level. Marshall fans, I realize your team was a IAA power under Jim Donnan and then Bob Pruett, but that success was long ago and on a different plane of football. However, being non-traditional powers does not seem to be a likely reason for their homefield advantage. What else do they have in common? Most could potentially present weather and environmental challenges to their conference opponents. During their run in the Big East, Connecticut had the opportunity to host South Florida and Louisville, two teams that play in warmer climates, as well as a dome team in Syracuse. Las Vegas is a desert and can be extremely unforgiving early in the season and is over 2000 feet above sea level. El Paso is another desert city that can be extremely hot early in the season or bitterly cold late in the year with an even higher elevation than Las Vegas (over 3000 feet above sea level). Huntington does not appear to confer any significant weather related advantages to the Thundering Herd, but it does share another trait in common with the other three in that it is relatively isolated from its conference brethren. When Conference USA was in its twelve team format (2005-2012), Marshall was within 500 miles of only one league opponent (East Carolina). UTEP, another Conference USA staple, was not within 500 miles of any conference foe, with SMU being the closest at 650 miles away. During their time in the Big East (2005-2012), Connecticut was close to two conference opponents (Rutgers and Syracuse), with the Knights only 185 and the Orange 270 miles away. Every other league member was at least 500 miles away. UNLV was not closer than 300 miles to any conference mate during the majority of the Mountain West’s makeup, with San Diego State (330 miles) and BYU (375 miles) being the closest. 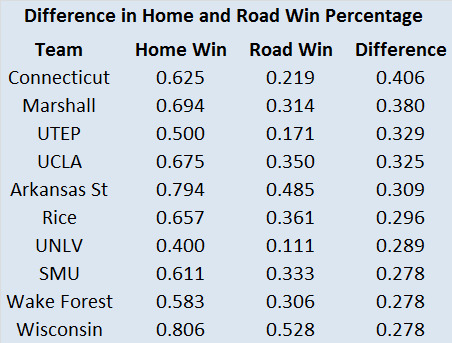 Being geographically isolated can have a positive impact on home performance and a negative impact on road performance, so that is a likely reason all four of these teams have such divergent home and road winning percentages. With that being said, it does bear mentioning that the most geographically isolated team in college football did not see a significant difference in their home and road play from 2005 to 2013. Hawaii won more often at home (21-14) than they did on the road (17-19), but during these nine years they tended to be either very good at home and on the road (see 2006, 2007, and 2010) or equally inept in any locale (see 2012 and 2013). One final thought on geography before I leave you. While West Virginia has not enjoyed any significant advantage in Morgantown since joining the Big 12 (3-6 at home and on the road), I think they will see a significant disparity in their home and road splits (assuming the conference affiliation stays as it is) since they are so far removed from the rest of their Big 12 opponents. Stay tuned for the next post where I’ll examine how homefield advantage manifests itself in overtime games.